Black and mixed-race commuters go to a taxi and train station. Many nonwhites live in distant townships. CAPE TOWN — For countless foreign visitors, Cape Town is an indelible symbol of the beauty and promise of post-apartheid South Africa. Beyond its gorgeous scenery and great wines, its very logo — an outline of majestic Table Mountain superimposed over a rainbow — emphasizes its historic mix of races and cultures, and its most famous resident, Desmond Tutu, is revered as a symbol of tolerance, inclusiveness and forgiveness. But for many black South Africans, this city represents something very different: the last bastion of white rule. “No matter how famous/rich u r, ur still a 2nd class citizen if ur Black in Cape Town,” Lindiwe Suttle, a singer and performance artist, wrote in a Twitter challenge to Helen Zille, the white leader of the party that governs this city. But that was hardly the last word. The Twitter battle, which broke out a few months ago and featured dueling hashtags (#capetownisracist and a countercampaign, #capetownisawesome), has given way to soul-searching in this city of 3.5 million people at the southern tip of Africa: Does this nation’s celebrated rainbow end where the mountain meets the sea? This is the only major metropolis in South Africa where black people are not the majority, and it remains deeply divided. The particularly harsh legacy of apartheid as it was carried out here has left especially deep scars that still demarcate the geography: whites in the city center and its mountainside inner suburbs, nonwhites in the distant townships on the Cape Flats. Apartheid policies effectively barred blacks from living or even working in the city, giving so-called colored, or mixed-race, people, today the city’s largest ethnic group, priority over blacks for jobs and housing. Beyond history, there is present-day politics. Western Cape is the only one of the country’s nine provinces not run by the governing African National Congress. It is run by Ms. Zille’s Democratic Alliance, which grew out of the white anti-apartheid movement but ultimately came to include remnants of the old National Party that created apartheid. In a speech last year in a black township near Cape Town, South Africa’s president, Jacob Zuma, said the city had an “extremely apartheid system,” according to local newspaper reports on his remarks. The African National Congress is trying to win the province, and the Democratic Alliance has dismissed the assertion that Cape Town is racist as a political ploy. “It is labeled a racist city by the A.N.C. 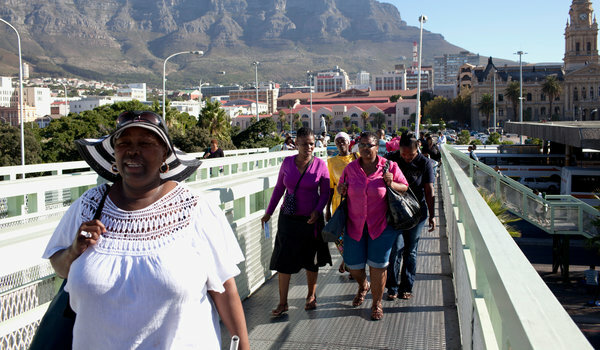 because it is the only metro in the country they don’t control,” said Patricia de Lille, the mayor of Cape Town. The city government is trying hard to change what Ms. de Lille calls “the spatial development of apartheid.” It has renamed two major boulevards in honor of Nelson Mandela, South Africa’s first black president, and Helen Suzman, an ardent white opponent of apartheid. The two streets converge in the center of the city, a merger meant to symbolize the hope of integration. The office is not the only place where blacks feel unwelcome. Many of the more exclusive Atlantic coast beaches, which used to prohibit blacks, still tend to attract almost entirely whites, reinforcing the divide. The discrimination black South Africans describe experiencing here is not the iron-fisted kind that marked the apartheid era. It is more subtle and sometimes hard to pin down. Some report being told that there are no tables available at an empty restaurant, or no cars at a well-stocked rental car office. Others recount being warned by white neighbors not to slaughter animals for festive occasions, or being mistaken for a prostitute simply for having drinks in a bar full of white patrons. And in a city where economic inequality yawns wide, class has in some ways become a proxy for race. Osiame Molefe, a journalist, recently wrote about being turned away from a nightspot. It is hard to reconcile Cape Town’s deep racial divides today with its history as one of the biggest melting pots in the world. Beginning in the 17th century, the Dutch East India Company brought slaves and prisoners from Mozambique and Madagascar, as well as from India and Indonesia. These groups intermarried. White blood inevitably entered the gene pool, too. In the 17th and 18th centuries, racial barriers existed but were not terribly rigid, historians say. One of the Cape’s earliest governors, Simon van der Stel, was of mixed race. But by the end of the 19th century, pseudoscientific attitudes about race had come into vogue, along with the popular notion of a hierarchy among races, with black Africans at the bottom. When the National Party came to power in 1948 and declared its new policy of apartheid, the separation between the races was etched in stone. People who lived in mixed communities like District 6 near the center of the city were forced from their homes and moved to desolate, segregated towns and townships on the Cape Flats, far from the city. Blacks were so unwelcome in Cape Town that it was often assumed that no blacks were actually from the city. Geoffrey Mamputa’s family has been in Cape Town since the middle of the 19th century, but people still ask him where his home is, even though blacks in the city outnumbered whites by almost two to one in a 2007 count. The racial tensions grew deeper as colored people received preferential treatment, part of a divide-and-rule strategy. During the 1970s and ’80s, when the fight against apartheid heated up, many colored people rejected the label, choosing to think of themselves as black. Students and professors at the University of the Western Cape, which the apartheid government had designated as a colored institution, used this self-identification to reject apartheid’s labeling. “One of the responses to the imposition of race categories is to reject racial categories,” said Suren Pillay, a professor at the university. But that moment was short-lived. In 1994, the colored vote in Western Cape largely went to the National Party, the architect of apartheid. And today, on the campus of the University of the Western Cape, a kind of voluntary segregation has re-emerged, with like sticking by like. Like many young black people, Ms. Khanyile would not consider remaining in Cape Town to pursue a career in business.